It's Philadelphia, 1876, and Benjamin Grimm and Eleanor Banneker, best friends forever, have not seen each other for seven years. Ever since her stepmother threw out his (servant-class) family when they were ten, they haven't heard a peep from each other. Ben divides his time between working with his mother at their family bookstore, working with his father at the theater, and working on his own trying to become an illusionist and feeding his obsession for automata and steam-powered machinery. When he picks out Ellie among a crowd of theater patrons one night, she is even more shocked than he is. When they meet up later on, she confides in him her fear that her stepmother, Olivia, has put a spell both on her and her father - for the last seven years, it's as if everyone she's met has been seeing a girl with some other face, even though she still sees herself in the mirror. Even her father hasn't seemed to recognize her. Olivia has been passing her off as a poor, unwanted niece. So she is surprised that Ben had recognized her. Despite the fact that he is learning to perform magic tricks (or maybe because of that), Ben doesn't believe in all that hocus pocus, but he agrees to help her anyway. However, time is running out - not only is father on his deathbed, but if they don't break the curse before the stroke of midnight, the spell will hold, and Ellie will never get her life back. If this sounds like a Cinderella story, it's because it is! It's a Cinderella story that is American steampunk and slightly magical too - yes, the spell IS a real thing, and the magical spellcaster in question is fae, but definitely no fairy godmother. Ellie is stuck in a bad situation, and considering how it's 1876, there's only so much she can do to rebel without getting tossed into the street. See, all the steampunk lit I've read so far has taken place in England, so debutantes and seasons and dance cards fit in perfect with my vision of that setting - I never really gave any thought to the idea that American society at the time would be extremely similar. There are still social classes - Ben and his family are part of the working class, and the Bannekers are high society. Ellie's stepmother had originally been her governess, and after the original Mrs. Banneker had passed away, she was elevated to a higher class through her marriage to Ellie's father. And this is actually the reason why she went to such great lengths - she resorted to making a magical bargain to secure her future and her daughter Rebecca's. But as we viewers of Once Upon a Time know, all magic comes with a price. So Ellie has to resort to sneaking around, gathering clues to her stepmother's wrongdoings, and meeting with Ben secretly to figure out how to break the spell. Ellie is strong, smart, and resourceful, but she's also human and flawed, which is great. I recently read a series of tweets from author Melissa Grey (whom I've reviewed on this blog before), defending Cinderella as a survivor of abuse, and while I still side-eye the Disney version of the story quite a bit, I definitely can appreciate how her interpretation can apply to Ellie - I definitely wasn't annoyed by Ellie the way I usually am by the Disney Cinderella. Ellie hasn't turned cold and hard, but she's not afraid to show her anger either; she has been treated unjustly, and she is going to do something about it. Ben doesn't have a counterpart in the original story, though if you go by the Disney version, I guess he would be her mouse friend? He is the Scully to Ellie's Mulder, doubting her claims of magic spells while still helping her all the same. He nerds out over steam engines and creates his own motorcar. He wants to become the next Houdini. He makes clockwork figurines that move on their own. He goes to great lengths to get his friend back and at the end of it all, he realizes that he's in love with her. I rolled my eyes a bit because I'm a little sick of YA love triangles, but this one ended up fine. He does a little friendzone-whining at the end of the book - just a little! - but it all ends up okay. In the end, the story teaches us that there are different ways to love people. And I'm glad that Ellie was not made to be wishy-washy on this point. Another departure from the original story (and a similarity to Ever After) was that the stepsister, Rebecca, was not evil. In fact, she wants Ellie to go to the ball too, and is constantly flashing apologetic looks at Ellie after Olivia has been particularly heinous. I loved that they were always allies in this story. Even when Olivia has made it clear that she wants Rebecca to be married to the same eligible bachelor whom Ellie has secretly developed feelings for, it's never really a competition. Rebecca couldn't care less about him, and she couldn't care less about high society since she had not come from high society. (Her mother was the governess, remember?) So there's no cattiness, no jealousy, no fighting over a man. Ah, refreshing! I also love that this story is partially grounded in reality. In the Author's Note at the end, Norris mentions that there really was a Centennial Exposition in Philadelphia in 1876 (which is incorporated into the events of the novel), and she name-drops some historical figures as well. (Is Ben somehow related to the original Brothers Grimm? He likes to think so.) This made the story extra interesting for me, and I found myself googling some things along the way. 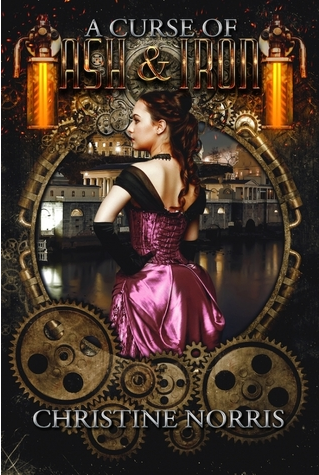 This book was loads of fun, and if you are a fan of steampunk and fairy tale retellings, you should definitely give this one a try. I would love it if Norris wrote a series of these about other fairy tales.